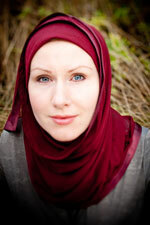 In her memoir, The Butterfly Mosque, American journalist and graphic novelist G. Willow Wilson described her move to Cairo after college, meeting her future husband, converting to Islam, and learning to acclimate to a Muslim culture very different from the secular one she’d grown up in. She turns to fiction with Alif the Unseen, her debut novel. In a lot of your work, you discuss the clash between East and West. How has living in both cultures influenced your writing? In some ways, it was a curse to be able to see both sides of the equation in terms of East versus West, Islam versus America. It forced me to walk a very fine line in order to balance the two perspectives. Americans look at the Middle East as a source of trauma because of 9/11. At the same time, I could see the fear going on in the Middle East as well—which would be the next country to be invaded or sanctioned? Being around those tensions was traumatic for me. But that tension honed my sense of compassion both for the reader and the subject, especially because they were two diametrically opposed groups. How has your perspective changed over time? When I was younger and idealistic, it was tempting to think of [the clash] as our great generational conflict and that I should do what I could to help figure everything out. As I got older and let that purpose go, I stopped trying to convince people of an idea or act as a go-between between where I came from in America and where I was living in Egypt. Now I focus on telling stories. When we read fiction, we want to get outside of ourselves and are able to see from a perspective we haven’t seen through before. That can be very powerful. Alif the Unseen is such a timely novel. You finished it during the Arab spring. I just finished a YA series for Marvel Comics called Mystic. It’s fantasy with a science-y edge and aimed toward girls. It was nominated for an Eisner Award. I’m also working on another novel set in the age of exploration. I don’t want to go into too much detail, but it’s based on the [pre-Columbian] Andalusian-American contact theory. There’s a character from Alif in it who was a fan favorite of the book’s early readers.